The persecution of Christians is now "worse than at any time in history," according to a report by the Catholic charity Aid to the Church in Need, which states that not only are Christians more persecuted than any other faith group, they are also experiencing the worst forms of persecution. The Europe-based group also found that in 12 of the 13 countries reviewed, the situation for Christians was worse in overall terms in the period 2015–17 than within the preceding two years, says the report titled, "Persecuted and Forgotten? 2015–17." 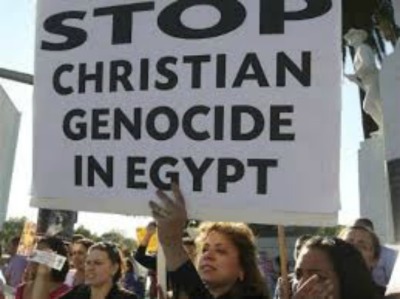 Egypt citizens protesting the genocide of Christians. "In many countries the situation was already so severe, it could scarcely get any worse, and yet it did – the obvious exception being Saudi Arabia, where a long-established pattern of some of the world's worst oppression saw no obvious indications of deterioration," it explains. In 2016, as many as 600,000 Christians may have suffered some form of persecution for their faith around the world. "While firm numbers are hard to come by … there is little doubt that the level of Christian persecution remains extremely high in a great number of places around the world," the report says, adding that the number of deaths are reported to have fallen below 100,000 in the past two years. 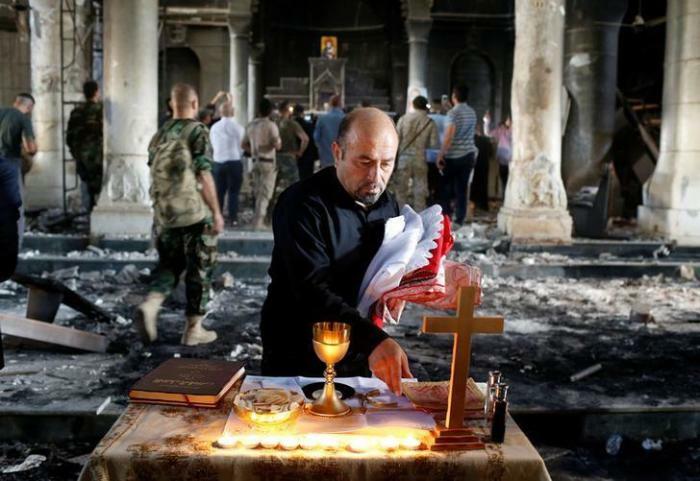 The report expresses a serious concern for the Christians in the Middle East, noting that "an eradication of Christians, and other minorities, was – and still is – the specific and stated objective of extremist groups at work in Iraq, Syria and elsewhere in the region, including Egypt." It quotes Chaldean Bishop Antoine Audo of Aleppo as saying in March 2016 that the number of Christians had reduced to 500,000, a fall of 1.2 million – or two-thirds - within five years. In Iraq, the Christian population declined from 275,000 in mid-2015 to below 200,000 two years later – and possibly as few as 150,000, the report says, warning that "if this decline were to continue at the same rate, it would show that" the previous report's "prediction of a virtual wipe-out of Iraq's Christian community by 2020 remains on track." "However," the report adds, "fears that Christians in Iraq are 'on the verge of extinction' were, to some extent, alleviated at the end of the reporting period by news of thousands of families returning to their homes on the Nineveh Plains following the defeat of Daesh (the Islamic State terror group, also known as ISIS, IS or ISIL)." It adds that genocide against Christians has also taken place in northern Nigeria, where Boko Haram, which is now believed to be affiliated with IS, started a campaign of violence to ensure the faithful "will not be able to stay." The report also highlights the fact that Christians have suffered increased violence and oppression in India after the 2014 rise to power of the right-wing Hindu nationalist Bharatiya Janata Party led by Prime Minister Narendra Modi. And in China, "intolerance was on the rise, as evidenced by a renewed clampdown on dissident clergy and destruction of churches as well as crosses and other Christian symbols." The report claims that the UN failed to offer Christians in countries such as Iraq and Syria the emergency help they needed as genocide got underway. It adds, "At a time in the West when there is increasing media focus on the rights of people regardless of gender, ethnicity or sexuality, it is ironic that in much of the secular media there should be such limited coverage of the massive persecution experienced by so many Christians." Prominent religious freedom advocate and evangelical figure Johnnie Moore earlier this month released a new book highlighting word-for-word testimonies of Christians worldwide who have endured severe persecution and know what it truly means to be willing to die for Christ. "Most of the stories in the book are recent stories, except for a few stories that are from the late '90s," Moore, an informal adviser to the Trump administration and a former senior vice president for communications at Liberty University, told The Christian Post in an interview. "We intentionally chose to include countries that have received less attention, countries like Eritrea, Nigeria and regular people. There are some pastors and leaders in the book but there are more regular, everyday Christians who have this amazing faith."